This study investigates the effects of SR141716, a selective CB1 receptor antagonist that reduces food intake and body weight of rodents, on Acrp30 mRNA expression in adipose tissue. Acrp30, a plasma protein exclusively expressed and secreted by adipose tissue, has been shown to induce free fatty acid oxidation, hyperglycemia and hyperinsulinemia decrease, and body weight reduction. We report thatN-(piperidin-1-yl)-5-(4-chlorophenyl)-1-(2,4-dichlorophenyl)-4-methyl-1H-pyrazole-3-carboximide hydrochloride (SR141716) treatment once daily (10 mg/kg/d, i.p.) from 2 to 14 days reduced body weight and stimulated Acrp30 mRNA expression in adipose tissue of obese Zucker (fa/fa) rats. In parallel, the hyperinsulinemia associated with this animal model was reduced by SR141716 treatment. In cultured mouse adipocytes (3T3 F442A), SR141716 (25 to 100 nM) also induced an overexpression of Acrp30 mRNA and protein. In addition, in adipose tissue of CB1-receptor knockout mice, SR141716 had no effect on Acrp30 mRNA expression, demonstrating a CB1 receptor mediating effect. Furthermore, RT-PCR analysis revealed that rat adipose tissue and 3T3 F442A adipocytes expressed CB1 receptor mRNA. Relative quantification of this expression revealed an up-regulation (3- to 4-fold) of CB1 receptor mRNA expression in adipose tissue of obese (fa/fa) rats and in differentiated 3T3 F442A adipocytes compared with lean rats and undifferentiated adipocytes, respectively. Western blot analysis revealed the presence of CB1receptors in 3T3 F442A adipocytes, and their expression was up-regulated in differentiated cells. These results show that SR141716 stimulated Acrp30 mRNA expression in adipose tissue by an effect on adipocytes, and reduced hyperinsulinemia in obese (fa/fa) rats. These hormonal regulations may participate in the body weight reduction induced by SR141716 and suggest a role of metabolic regulation in the antiobesity effect of SR141716. Obesity is a complex metabolic disorder resulting from an abnormality in the balance between energy intake and expenditure. This dysregulation may have genetic and/or behavioral origins, involving the quality and quantity of food intake and lifestyle (Carpino, 2000). Obesity is also commonly associated with insulin resistance and hyperinsulinemia (Polonsky, 2000; Weyer et al., 2001), which increases the risk of diabetes and cardiovascular diseases (Allison et al., 1999; Must et al., 1999). The hypothalamus is the principal brain region playing a pivotal role in the integrated control of feeding, energy homeostasis, and regulation of body weight (Elmquist et al., 1999; Kalra et al., 1999). This function is mediated in part by the synthesis and release of several neurotransmitters and neuropeptides involved in the control of food intake, energy expenditure, and body weight homeostasis. These include monoamine neurotransmitters, such as serotonin and noradrenaline (Halford and Blundell, 2000), orectic neuropeptides, such as neuropeptide Y, orexins (A and B), and anorectic peptides, such as cocaine- and amphetamine-regulated transcript and pro-opiomelanocortin-derived peptides, such as α-MSH (Kalra et al., 1999; Proietto et al., 2000). The hypothalamus is also a target site for the action of hormones such as insulin and leptin, which have been largely described to be involved in the regulation of food intake and body weight (Baskin et al., 1999; Elmquist et al., 1999; Kalra et al., 1999; Proietto et al., 2000; Williams et al., 2001). Recently, a role for the cannabinoid receptor subtype 1 (CB1-R) in the regulation of appetite and body weight has been reported (Di Marzo et al., 2001). There is an elevation of the level of endocannabinoids in the hypothalamus of obese animal models, and the CB1 receptor antagonist SR141716 (Rinaldi-Carmona et al., 1994) reduces food intake and induces weight loss in mouse and rat (Arnone et al., 1997; Chaperon et al., 1998;Colombo et al., 1998; Di Marzo et al., 2001). Furthermore, after an 18-h food restriction period, CB1 receptor knockout mice eat less than their wild-type littermates, and SR141716 has no effect on weight gain and food intake on CB1 receptor knockout mice (Di Marzo et al., 2001). These findings suggest a physiological role for the hypothalamic CB1 receptor in the control of appetite. They also indicate that endocannabinoids, in the hypothalamus, may tonically activate CB1 receptors to maintain food intake and to sustain overeating in obese animals (Colombo et al., 1998; Di Marzo et al., 2001). The reported loss of body weight induced by SR141716 results in part from its rapid and strong decrease of food intake during the first days of treatment (Colombo et al., 1998; Di Marzo et al., 2001). This effect may be mediated by a mechanism involving the regulation of the expression of hypothalamic neuropeptides (Proietto et al., 2000). Furthermore, the long-lasting loss of body weight induced by SR141716 may be independent of food intake and is likely to be related to an increase in energy expenditure and/or metabolic activities. The site of action of SR141716 with regard to a potential peripheral effect could be the adipose tissue, which is the major fat storage depot. This endocrine organ produces and secretes various physiologically important proteins, such as leptin, adipsin, lipoprotein lipase, and tumor necrosis factor α, which regulate whole-body energy homeostasis (Dugail et al., 1992; Fried and Russell, 1998). One of these proteins, the 30-kDa adipocyte complement-related protein (Acrp30) originally identified by four independent groups (Hu et al., 1996; Maeda et al., 1996; Nakano et al., 1996; Scherer et al., 1995), also known as adiponectin, Adipo Q, and ApM1, is exclusively expressed in the adipose tissue. Acrp30 is a secreted protein, with an N-terminal collagenous domain and a C-terminal globular domain. The latter domain carries all the known pharmacological activities of Acrp30, comprising the induction of free fatty acid oxidation, body weight reduction in mouse (Fruebis et al., 2001), hyperglycemia (Berg et al., 2001; Combs et al., 2001), hyperinsulinemia decrease, and insulin resistance reversion (Yamauchi et al., 2001) in obese and diabetic animals. Furthermore, the plasma level of the protein Acrp30 and its mRNA expression in adipose tissue are decreased in both murine and human obesity, as well as in subjects with type 2 diabetes (Hu et al., 1996;Arita et al., 1999; Fruebis et al., 2001; Weyer et al., 2001). The aim of the present work was to determine whether SR141716 affects the regulation of Acrp30 mRNA expression in adipose tissue and to provide evidence for the implication of peripheral CB1 receptors in the control of body weight. Male obese Zucker (fa/fa) rats and their lean littermates of 8 to 9 weeks of age were purchased from Harlan (Indianapolis, IN). C57BL/6j mice with deleted CB1 receptor gene (CB1-R −/−) and wild-type C57BL/6j mice (CB1-R +/+) were bred as described previously (Robbe et al., 2002) and used at 9 to 10 weeks of age. All animals were housed in groups of six with food and water freely available and were maintained at room temperature. Animals were administered once a day, with either vehicle or SR141716 at tested doses (3 or 10 mg/kg/d) by intraperitoneal injection (i.p.) for different periods of treatment (from 2 to 14 days). They were killed by decapitation 24 h after the last injection. Abdominal subcutaneous adipose tissues were collected, pooled by groups of six animals, and frozen immediately at −80°C. After the rats were killed, individual trunk blood was collected for determining plasma levels of insulin by radioimmunoassay as described in the manufacturer's protocol (Amersham Biosciences, Les Ulis, France). All procedures were approved by the Comité d'Experimentation Animale (Animal Care and Use Committee) of Sanofi-Synthélabo Research. Mouse 3T3 F442A cells (Green and Kehinde, 1973; Kuri-Harcuch and Green, 1977) were maintained in Dulbecco's modified Eagle's medium (DMEM) containing 10% calf serum and differentiated with DMEM supplemented with 10% fetal calf serum and 5 μg/ml of insulin after reaching subconfluence as described previously (Hu et al., 1996). Appropriate differentiation was confirmed by noting the accumulation of lipid droplets by microscopic observation, 6 to 8 days after the initiation of differentiation. RNA Preparation and Northern Blot Analysis. β Actin cDNA probe was purchased from BD Biosciences Clontech (Palo Alto, CA). Rat and mouse Acrp30 cDNA probes were obtained by RT-PCR on adipose tissue RNA according to the manufacturer's protocol (Invitrogen, Cergy Pontoise, France) in the presence of two Acrp30 cDNA-specific primers (sense primer, 5′-CAG GAT GCT ACT GTT GCA AGC-3′; antisense primer, 5′-TGC AGT CAG TTG GTA TCA TGG-3′) spanning the start and stop codons, respectively, in the sequence of the mouse Acrp30 cDNA (GenBank accession number U37222). Total RNA was prepared from frozen adipose tissues or from adipocyte 3T3 F442A cell cultures, using TRIzol reagent (Invitrogen). For Northern blot analysis, 20 μg of total RNA was electrophoresed and transferred to a nylon membrane (Hybond N+; Amersham Biosciences). The membranes were hybridized successively with Acrp30 and β actin probes labeled with [α32P]dCTP, using a random priming kit (Amersham Bisociences). Membranes were scanned on a Storm PhosphorImager (Amersham Biosciences). Northern blot analysis revealed the expression of one and three Acrp30 transcripts in mouse and rat tissues, respectively, as reported previously (Hu et al., 1996). Relative quantification of RNA expression levels was performed with the IMAGE-QuaNT program (Amersham Biosciences). Results were normalized against the β actin mRNA expression and were presented as a percentage of control values. RT-PCR Analysis of CB1 Receptor Expression. For RT-PCR, 2 μg of total RNA from rat adipose tissues and 3T3 F442A cells were reverse-transcribed using oligo(dT) primer, and PCR amplification of the first-strand cDNA product was carried out according to the manufacturer's protocol (Invitrogen) in the presence of either two CB1 receptor cDNA specific primers (sense primer, 5′-TCT CTG GAA GGC TCA CAG C-3′; antisense primer, 5′-TGT CTG TGG ACA CAG ACA TG-3′) or two β-actin cDNA-specific primers (sense primer, 5′-GGG TCA CCC ACA CTG TGC-3′; antisense primer, 5′-TGC TTG CTG ATC CAC ATC TG-3′). The following temperature profile was used for PCR amplification: an initial denaturing step at 93°C for 1 min and 35 cycles consisting of 93°C for 30 s, 55°C for 30 s, and 72°C for 1 min. PCR products were analyzed by Southern blot using a 32P-labeled oligonucleotide probe specific for CB1 receptor or β actin cDNA. The relative mRNA expression levels of CB1 receptor and β actin were quantified using the Storm PhosphorImager system. Results were normalized and presented as described above. 3T3 F442A adipocyte cellular proteins were dissolved in the lysis buffer: 50 mM Tris HCl, pH 7.5, 1% SDS, 10 mM EDTA, 100 mM NaCl, and 1% β-mercaptoethanol containing protease inhibitors (Roche Diagnostics, Mannheim Germany), and centrifuged at 12,000g for 15 min at 4°C. The supernatants were collected and protein concentrations were determined by bicinchoninic acid protein assay kit (Pierce, Rockford, IL). Cellular protein extracts (200 μg) were analyzed on the NOVEX precast 4 to 20% Tris-glycine-SDS-polyacrylamide gel electrophoresis gels and transferred on polyvinylidene difluoride membranes as indicated by the manufacturer (Novex, San Diego, CA). The following steps were performed at room temperature. The membranes were blocked with TBST (20 mM Tris-HCl, pH 7.5, 150 mM NaCl, and 0.1% Tween 20) containing 5% nonfat dry milk for 1 h and then they were incubated for 3 h with specific antibodies, rabbit anti-mouse Acrp30 or rabbit anti-mouse CB1 receptor (Affinity Bioreagents, Golden, CO) in TBST. After three washes for 10 min in TBST, membranes were then incubated for 30 min with horseradish peroxidase-conjugated, anti-rabbit antiserum (Sigma, Saint-Quentin Fallavier, France). Membranes were then washed three times for 10 min in TBST. The immunoreactivity was revealed with the ECL+ chemiluminescent substrate (Amersham Biosciences). Membranes were scanned on a Kodak Image Station 440 CF (Eastman Kodak, Rochester, NY) and relative quantification of Acrp30 and CB1 receptor proteins were performed with image analysis software (Kodak). SR141716 Reduced Body Weight of Obese Zucker (fa/fa) Rats. Obese (fa/fa) rats showed a rapid body weight reduction during the first 4 days of treatment with SR141716 (10 mg/kg/d). Body weight was reduced up to 20% on day 4 compared with the initial body weight at day 0 (Fig. 1). These results agree with those reported previously (Colombo et al., 1998). Furthermore, after the fourth day of treatment and throughout the complete treatment period, body weight of SR141716-treated rats continued to be lower than that of vehicle-treated rats (Fig. 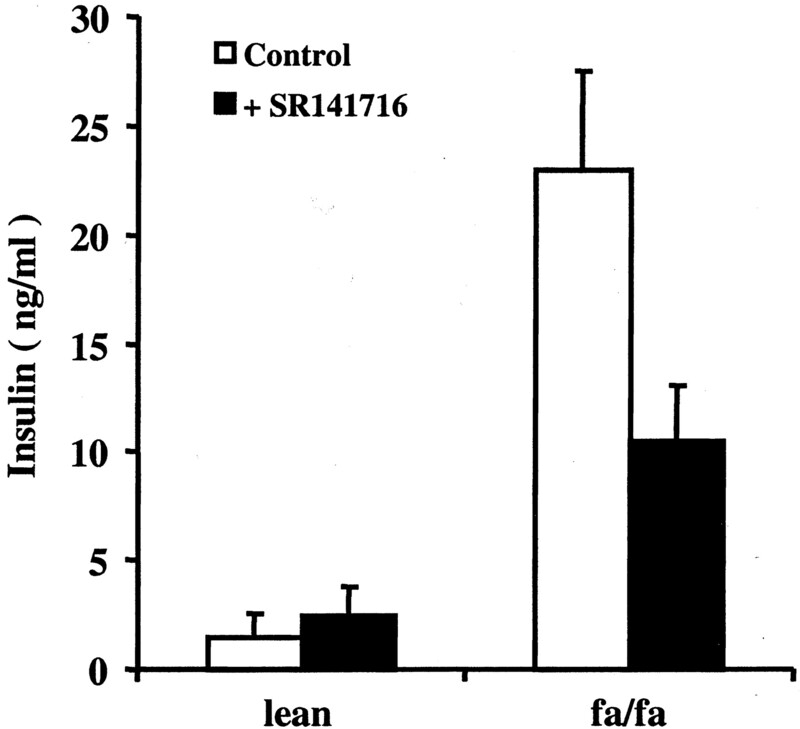 1), whereas food intake of SR141716 treated-fa/fa rats became comparable with that of lean rats (Colombo et al., 1998; M. Arnone, L. Millet, M. F. Desclaux, C. Delgorge, P. Keane, J. P. Maffrand, P. Soubrié, submitted). This suggests a metabolic and energy expenditure regulation by SR141716 in addition to its early reduction of food intake. Effect of SR141716 on obese Zucker (fa/fa) rat's body weight. Obese Zucker (fa/fa) rats were administered (i.p.) once daily, by vehicle or by SR141716 (10 mg/kg/d). Rat body weight was monitored every 2 days from the first day (day 0) to 14 days of treatment. Data are expressed as means of body weight differences, between day 0 and indicated days. Each experimental point represents the mean ± S.E.M. of 12 rats. SR141716 Increased Acrp30 mRNA Expression in Adipose Tissue of Obese Zucker (fa/fa) Rats. The expression of Acrp30 was increased by 1.33- and 1.37-fold in adipose tissue of obese (fa/fa) rats treated once a day for 4 days with SR141716 at 3 and 10 mg/kg/d, respectively, compared with control animals that received vehicle (Fig.2). The rate of stimulation of Acrp30 expression induced by SR141716 was dependent on the duration of the treatment. At a dose of SR141716 (10 mg/kg/d), there was a 1.37- and 1.8-fold increase in Acrp30 expression after 4 and 10 days of treatment, respectively. This level of expression remained constant until day 14 (Fig. 3A). No effect of SR141716 was observed before day 4 (data not shown). Northern blot analysis of the effect of SR141716 on the Acrp30 expression in obese (fa/fa) rat adipose tissues. Total RNA, prepared from adipose tissues of obese Zucker (fa/fa) rats, treated once daily i.p. for 4 days, with vehicle (control) or with SR141716 at 3 and 10 mg/kg/d were analyzed by Northern blot and probed successively with Acrp30 and β actin cDNA as described under Materials and Methods. A, representative Northern blot analysis. B, bar graph shows results of quantification analysis of Acrp30 expression using IMAGE QuaNT program (Amersham Biosciences) and normalized against the β actin expression levels. Values represent the mean ± S.E.M. from three independent experiments. **, p < 0.01, compared with control. Effect of chronic treatment with SR141716 on the expression of Acrp30 in adipose tissues of Zucker obese (fa/fa) and lean rats. Total RNA were prepared from adipose tissues of obese Zucker fa/fa (A) and lean Zucker (B) rats, treated once daily, i.p., with vehicle (control) or with SR141716 (10 mg/kg/d), for 4, 10, and 14 days. They were analyzed by Northern blot as described above. Graphs represent relative quantification analysis results of the Acrp30 expression, as described in Fig. 2. Values represent the mean ± S.E.M. from three independent experiments. *, p < 0.05; ** p < 0.01, compared with control. In adipose tissue of lean Zucker rats, SR141716 (10 mg/kg/d) had no detectable effect on Acrp30 expression after 4 days of treatment, but there was a slight but significant increase (1.25-fold) in Acrp30 expression after 10 or 14 days of treatment (Fig. 3B). 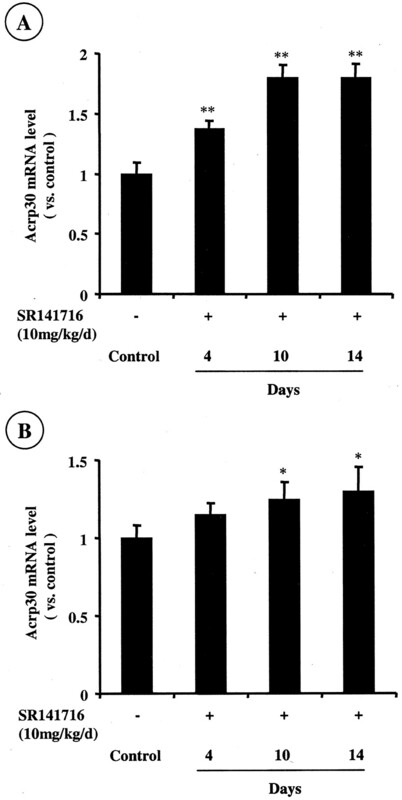 SR141716 Stimulated Acrp30 mRNA and Protein Expression in Cultured Mouse 3T3 F442A Adipocyte Cells. The addition of SR141716 (100 nM) to subconfluent cultures of 3T3 F442A adipocytes, induced a rapid and strong increase in Acrp30 expression. As shown in Fig.4A, the stimulation rate of Acrp30 mRNA expression, compared with that of control cultures, was 1.4- and 1.8-fold after 30 and 60 min of SR141716 incubation, respectively. At 60 min of treatment, SR141716 increased Acrp30 expression in a concentration-dependent manner from 25 to 200 nM with a maximal effect at 100 nM (Fig. 4B). In parallel, after 4 days of treatment, SR141716 increased in a concentration-dependent manner (from 50 to 200 nM) the level of the protein Acrp30 in 3T3 F442A adipocytes, with a maximal effect at 100 nM (Fig. 4C). Effect of SR141716 on Acrp30 expression in mouse 3T3 F442A adipocyte cells. Mouse 3T3 F442 adipocyte cells were cultured in DMEM supplemented with 10% calf serum. At subconfluence, culture medium was changed and cells were exposed or not (control) to 100 nM SR141716. At indicated times, total cellular mRNA were prepared and analyzed by Northern blot as described under Materials and Methods. A, representative Northern blot analysis. Bar graph shows results of quantification analysis of Acrp30 expression normalized against the expression levels of β actin. Values represent mean ± S.E.M. from three independent experiments. **,p < 0.01, compared with control. B, concentration-dependent effect of SR141716 (at 60 min at the treatment) on Acrp30 mRNA expression. C, concentration-dependent effect of SR141716 on Acrp30 protein level. Subconfluent mouse 3T3 F442A adipocytes were exposed or not (control) to various concentrations of SR141716 (50 to 200 nM) every day for 4 days. Cellular protein extracts were analyzed by Western blot using rabbit anti-mouse Acrp30 antibody at 1:1000. Values represent the mean ± S.E.M. from three independent experiments. *, p < 0.05; **,p < 0.01, compared with control. CB1 Receptor Mediated the SR141716-Stimulation of Acrp30 Expression in Adipose Tissue. In adipose tissue of wild-type mice (CB1-R +/+), SR141716 (10 mg/kg/d) induced a slight and significant increase of the Acrp30 expression (1.25-fold) after 10 days of treatment (Table1). This SR141716 stimulation rate is comparable with that observed in lean Zucker rats (Fig. 3B). 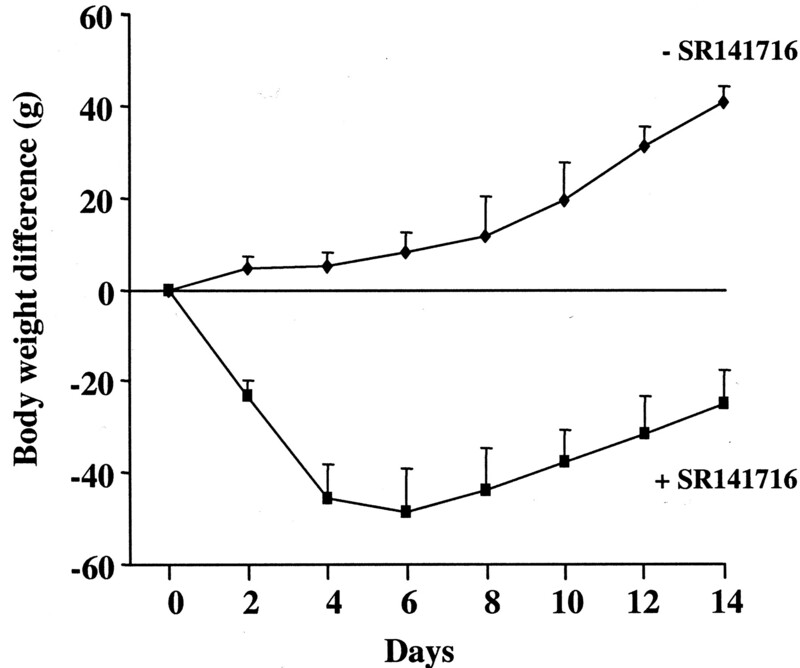 By contrast, as shown in Table 1, once-daily treatment with SR141716 (10 mg/kg/d) for 4 or 10 days did not induce any effect on Acrp30 expression in adipose tissue of CB1 receptor knockout mice (CB1-R −/−). CB1 Receptor Expression Analysis in Rat Adipose Tissue and in Mouse 3T3 F442A Adipocyte Cells. CB1receptor expression was assessed by RT-PCR analysis, using specific oligonucleotide primers, on mRNA isolated from rat adipose tissues of obese (fa/fa) and lean Zucker rats and from undifferentiated and differentiated 3T3 F442A adipocyte cells in culture. As shown in Fig.5, A and B, all these tissues and cells expressed CB1 receptor mRNA. Relative quantification analysis of this CB1 receptor expression, normalized against that of β actin, revealed an up-regulation of the CB1 receptor expression in adipose tissue of obese rats which was 3.11-fold higher than that observed in lean rats. Furthermore, in differentiated 3T3 F442A adipocyte cells, the expression of CB1 receptor mRNA was 4.35-fold higher than that obtained in undifferentiated adipocytes. The fact shows that CB1 receptor was present in 3T3 F442A adipocyte cells and that its level was 4.9 fold higher in differentiated adipocyte cells compared with the level observed in undifferentiated cells shown in Fig. 5C. RT-PCR analysis of CB1 receptor mRNA expression. Total RNA isolated from adipose tissues of obese Zucker (fa/fa) rats or their lean littermates (lean) and from differentiated (D) or undifferentiated (U) 3T3 F442A adipocyte cells were reverse transcribed and submitted to PCR amplification, using sense and antisense primers specific for CB1 receptor cDNA or for β actin cDNA. RT-PCR products were analyzed by Southern blot and probed with a 32P-labeled internal oligonucleotide probe specific for CB1 receptor or for β actin cDNA. CB1receptor expression, normalized against that of β actin was quantified by using IMAGE QuaNT program (Amersham Biosciences). A, representative RT-PCR analysis. B, bar graph shows results of quantification analysis. 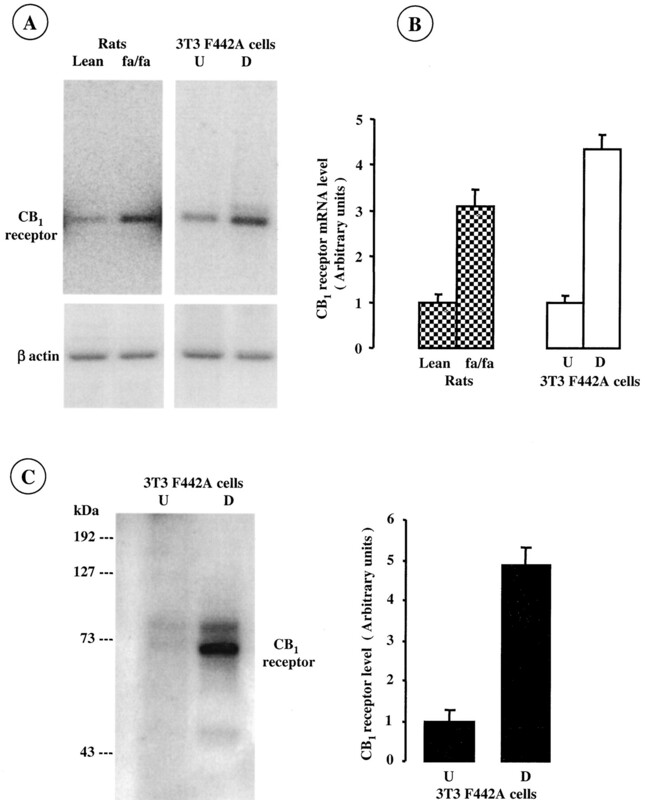 C, Western blot analysis of CB1-R levels in 3T3 F442A adipocyte cells. Cellular proteins extracted from differentiated (D) and undifferentiated (U) adipocytes were analyzed by Western blot using rabbit anti-mouse CB1-R antibody at 1:500. Values represent mean ± S.E.M. from two independent experiments. SR141716 Decreased Hyperinsulinemia in Obese Zucker (fa/fa) Rats. We also investigated the effect of SR141716 on the hyperinsulinemia characterizing obese Zucker (fa/fa) rats. Once daily treatment of obese (fa/fa) rats with SR141716 (10 mg/kg/d, i.p.) for 4 days, induced a strong decrease in plasma insulin rate (60%) in comparison with the insulin rate of control animals that received vehicle (Fig. 6). In contrast, SR141716 treatment in the same condition had no effect on the plasma insulin levels of lean Zucker rats (Fig. 6). Regulation of the hyperinsulinemia by the SR141716. Plasma insulin was measured by radioimmunoassay as described in the manufacturer's protocol (Amersham Biosciences), in obese Zucker (fa/fa) rats and in their lean littermates (lean), treated once daily i.p. for 4 days, with either vehicle (control) or SR141716 at 10 mg/kg/d. Each experimental point represents the mean ± S.E.M. of 12 rats. Recently, it has been reported that SR141716, a selective CB1-receptor antagonist, reduced body weight of genetically obese Zucker (fa/fa) rats (M. Arnone, L. Millet, M. F. Desclaux, C. Delgorge, P. Keane, J. P. Maffrand, P. Soubrié, submitted). This SR141716-induced body weight loss seems to comprise two phases. The early phase is principally food intake-regulation–dependent: during the first days of treatment, SR141716 reduced both food intake and body weight. This SR141716-induced body weight loss may originate from the decrease of food intake, which may itself be mediated by a regulation of the expression and release of hypothalamic neuropeptides involved in both the control of appetite and body-weight regulation (i.e., a central effect of SR141716) (Elmquist et al., 1999; Kalra et al., 1999;Proietto et al., 2000). The second phase is food intake-regulation–independent: after the early phase (4 days of treatment) and throughout the entire period of treatment, SR141716-induced body weight loss was maintained, whereas food intake returned to a level comparable with that of nonobese (lean) rats. These results agree with those reported previously (Colombo et al., 1998; M. Arnone, L. Millet, M. F. Desclaux, C. Delgorge, P. Keane, J. P. Maffrand, P. Soubrié, submitted) and suggest a metabolic and energy expenditure regulation by long term SR141716-treatment. Acrp30 is a plasma protein exclusively expressed in adipose tissue and has been reported to regulate hyperglycemia, hyperinsulinemia and fatty acid oxidation (Berg et al., 2001; Combs et al., 2001; Fruebis et al., 2001; Yamauchi et al., 2001). Intravenous injection of Acrp30 reduced body weight in obese animals, in a food intake-independent manner (Fruebis et al., 2001). Furthermore, both the plasma levels and adipose tissue mRNA of Acrp30 are decreased in obese subjects (Hu et al., 1996; Arita et al., 1999; Fruebis et al., 2001;Weyer et al., 2001). Therefore, we investigated the effect of SR141716 on Acrp30 mRNA expression in adipose tissue. Our results show that, after 4 days of treatment, SR141716 stimulated Acrp30 mRNA expression in adipose tissue of obese Zucker (fa/fa) rats. This stimulation was also found to occur within 30 min of SR141716 treatment of cultured mouse 3T3 F442A adipocyte cells. Furthermore, like Acrp30 mRNA, SR141716 treatment also increased Acrp30 protein levels in mouse 3T3 F442A adipocyte cells. We also show that in adipose tissue of wild-type mice, SR141716 induced an up-regulation of Acrp30 mRNA expression with a level of stimulation comparable with that observed in lean Zucker rats. In contrast, SR141716 had no effect on Acrp30 mRNA expression in adipose tissue of CB1 knockout mice (CB1-R −/−). 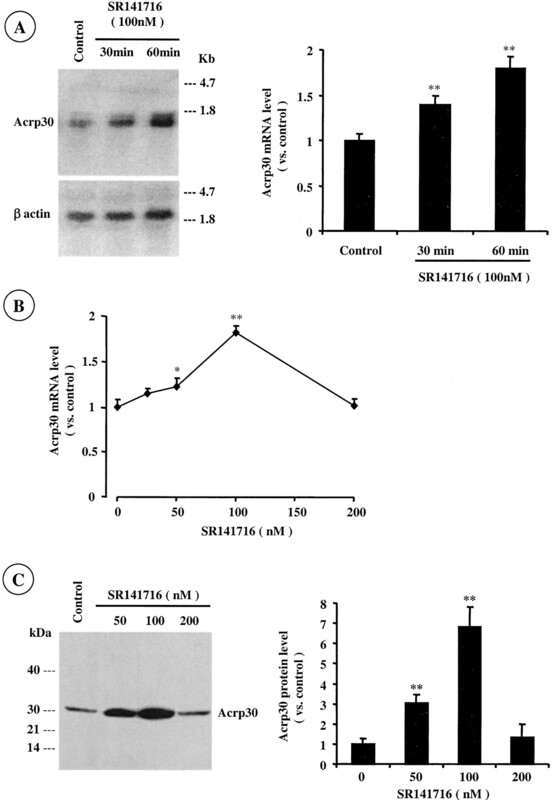 These results demonstrated that SR141716 regulates Acrp30 expression in adipocytes through a CB1 receptor-mediated pathway, but the mechanism involved in this SR141716 effect remains to be fully elucidated. Using RT-PCR analysis, we provide evidence that adipose tissue of lean and obese rats and cultured mouse 3T3 F442A adipocyte cells express the CB1 receptor and protein. Additionally, CB1 receptor expression is up-regulated in adipose tissue of obese (fa/fa) rats and in differentiated mouse 3T3 F442A adipocyte cells. Together, these results suggest a role for adipose tissue CB1 receptors in the control of body weight homeostasis, as illustrated by the effects of the CB1 receptor antagonist SR141716, and agree with those reported previously (Di Marzo et al., 2001). Hyperinsulinemia and insulin resistance are commonly associated with obesity (Allison et al., 1999; Must et al., 1999; Polonsky, 2000) and with a decrease of Acrp30 plasma levels (Weyer et al., 2001). In parallel to the increase of Acrp30 mRNA expression in adipose tissue, SR141716 treatment decreased the hyperinsulinemia characterizing obese (fa/fa) rats. This effect may involve a direct action of SR141716 on plasma insulin levels of obese (fa/fa) rats or may be mediated by the stimulation of Acrp30, which has been shown to decrease hyperinsulinemia and reverse insulin resistance (Yamauchi et al., 2001). Whatever the mechanism involved in the effects of SR141716, the decrease of hyperinsulinemia may participate to the overall action of SR141716 on body weight regulation. This hypothesis agrees with the proposal that decreasing hyperinsulinemia may be a therapeutic approach to treat obesity, in particular that associated with type 2 diabetes (Campfield et al., 1995). In summary, SR141716 stimulated Acrp30 mRNA expression in adipose tissue and decreased hyperinsulinemia in obese Zucker (fa/fa) rats. The regulation by SR141716 of a protein involved in lipid metabolism (Acrp30) and of a metabolic hormone (insulin) suggests that these factors may be among the principal mediators of the metabolic effects of SR141716 leading to body weight reduction and indicates that SR141716 may antagonize an endogenous endocannabinoid tone or could exert this effect by its agonist inverse activity previously described (Bouaboula et al., 1997). Other enzymes and hormones may also participate in these metabolic effects of SR141716. Finally, our data demonstrate for the first time that SR141716 regulates hormones implicated in lipid and glucose metabolism and clearly underline that SR141716 could exert a metabolic “peripheral” action in addition to its known “central” effect on food intake. The regulation of food intake and body weight by SR141716 may result from these closely related and complementary effects. We thank Ruth LeGué for typing the manuscript, Isabel Lefevre for criticism and helpful comments, and John Alexander for editing the article. (1999) Annual deaths attributable to obesity in the United States. J Am Med Assoc 282:1530–1538. (1999) Paradoxical decrease of an adipose-specific protein, adiponectin, in obesity. Biochem Biophys Res Commun 257:79–83. (1997) Selective inhibition of sucrose and ethanol intake by SR 141716, an antagonist of central cannabinoid (CB1) receptors. Psychopharmacology 132:104–106. Arnone M, Millet L, Desclaux MF, Delgorge C, Keane P, Maffrand JP and Soubrié P SR141716 reduces weight gain in obese Zucker rats by regulating hyperphagia and activating fatty acid oxidation.Br J Pharmacol,. (1999) Insulin and leptin: dual adiposity signals to the brain for the regulation of food intake and body weight. Brain Res 848:114–123. 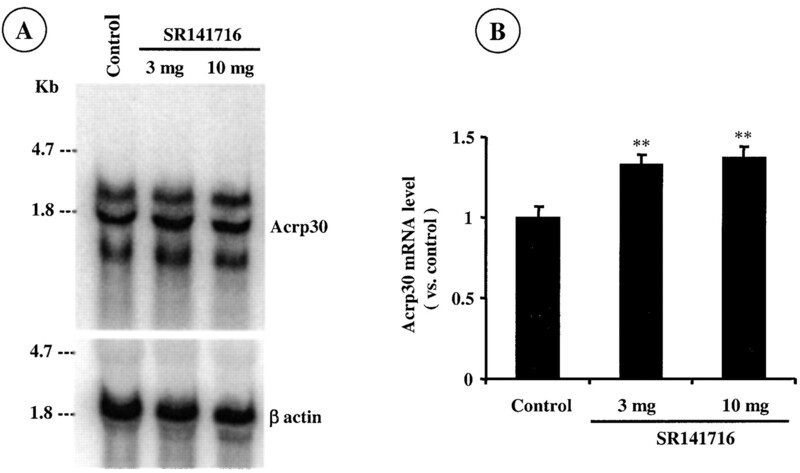 (2001) The adipocyte-secreted protein Acrp30 enhances hepatic insulin action. Nat Med 7:947–953. (1997) A selective inverse-agonist for central cannabinoid receptor inhibits mitogen-activated protein kinase activation stimulated by insulin and insulin-like growth factor 1. J Biol Chem 272:22330–22339. (1995) Insulin normalization as an approach to the pharmacological treatment of obesity. Obes Res 3 (Suppl 4) 591s–603s. (2000) Patent focus on new anti-obesity agents: September 1999–February 2000. Expert Opin Ther Patents 10:819–831. (1998) Involvement of central cannabinoid (CB1) receptors in the establishment of place conditioning in rats. Psychopharmacology 135:324–332. (1998) Appetite suppression and weight loss after the cannabinoid antagonist SR 141716. Life Sci 63:L113–L117. (2001) Endogenous glucose production is inhibited by the adipose-derived protein Acrp30. J Clin Investig 108:1875–1881. (2001) Leptin-regulated endocannabinoids are involved in maintaining food intake. Nature (Lond) 410:822–825. (1992) Gene expression of lipid storage-related enzymes in adipose tissue of the genetically obese Zucker rat. Coordinated increase in transcriptional activity and potentiation by hyperinsulinaemia. Biochem J 281:607–611. (1999) From lesions to leptin: hypothalamic control of food intake and body weight. Neuron 22:221–232. (1998) Diverse roles of adipose tissue in the regulation of systematic metabolism and energy balance. in Handbook of Obesity, eds Bray GA, Bouchard C, James W (Marcel Dekker, New York), pp 397–413. (2001) Proteolytic cleavage product of 30-kDa adipocyte complement-related protein increases fatty acid oxidation in muscle and causes weight loss in mice. Proc Natl Acad Sci USA 98:2005–2010. (1973) Sublines of mouse 3T3 cells that accumulate lipid. Cell 1:113–116. (2000) Pharmacology of appetite suppression. Prog Drug Res 54:25–58. (1996) AdipoQ is a novel adipose-specific gene dysregulated in obesity. J Biol Chem 271:10697–10703. (1999) Interacting appetite-regulating pathways in the hypothalamic regulation of body weight. Endocrine Rev 20:68–100. (1977) Increasing activity of enzymes on pathway of triacylglycerol synthesis during adipose conversion of 3T3 cells. J Biol Chem 252:2158–2160. (1996) cDNA cloning and expression of a novel adipose specific collagen-like factor, apM1 (AdiPose Most abundant Gene transcript 1). Biochem Biophys Res Commun 221:286–289. (1999) The disease burden associated with overweight and obesity. J Am Med Assoc 282:1523–1529. (1996) Isolation and characterization of GBP28, a novel gelatin-binding protein purified from human plasma. J Biochem 120:803–812. (2000) Dynamics of insulin secretion in obesity and diabetes. Int J Obes Relat Metab Disord 24 Suppl 2:S29–S31. (2000) Novel anti-obesity drugs. Expert Opinion on Investigational Drugs 9:1317–1326. (2002) Endogenous cannabinoids mediate long-term synaptic depression in the nucleus accumbens. Proc Natl Acad Sci USA 99:8384–8388. (1995) A novel serum protein similar to C1q, produced exclusively in adipocytes. J Biol Chem 270:26746–26749. (2001) Hypoadiponectinemia in obesity and type 2 diabetes: close association with insulin resistance and hyperinsulinemia. J Clin Endocrinol Metab 86:1930–1935. (2001) The fat-derived hormone adiponectin reverses insulin resistance associated with both lipoatrophy and obesity. Nat Med 7:941–946.